The German leftist newspaper Junge Welt recently published an interview with me by Gabriel Kuhn, under the title "Die 'Alt-Right' will USA zu Ethnostaat umwandeln" [The "alt-right" wants to replace the USA with an ethno-state]. The interview refers to my 2015 book Arier, Patriarchen, Übermenschen: Die extreme Rechte in den USA [Aryans, Patriarchs, Supermen: The Far Right in the USA], which Gabriel translated into German and which was published by Unrast Verlag. An English language version of the interview is below. Kuhn: When your book Arier, Patriarchen, Übermenschen was released in 2015, few people understood how relevant it would be only a year later. How strong are the connections between Donald Trump and the far right? Lyons: More than any other major presidential candidate in decades, Donald Trump benefited from far right support and emphasized themes that appeal to far rightists, such as Islamophobia, scapegoating immigrants, and a populist attack on the Republican Party’s conservative leadership. His ties with the alt-right, although indirect, were particularly strong through advisors such as Steve Bannon. After the election, alt-rightists proclaimed themselves the vanguard of the Trump coalition. However, alt-rightists never saw Trump as one of their own, but rather as someone who could slow down “white genocide” and open up political space for them to promote their own message. They have been increasingly disappointed as the Trump administration has largely pursued a conventional conservative agenda on issues such as taxes, health care, and deregulation of industry. Trump’s military strikes against the Syrian government shocked and angered alt-rightists and also many Patriot movement activists. They saw the strikes as proof that Trump has been pressured or bought off by neoconservatives and globalist elites, forces which alt-rightists (but not Patriot activists) explicitly identify with Jews. Kuhn: Which are the forces that constitute the "alt-right"? Lyons: The alt-right originated around 2010 as a convergence of several rightist forces that were hostile to mainstream conservatism. Major influences included the French Nouvelle Droite and the European New Right more broadly (which began as a post-1968 effort to make fascist ideology more palatable by incorporating elements of liberal and leftist thought, such as an emphasis on “diversity”) and paleoconservatism (an American current that emphasized economic protectionism, cultural nationalism and opposition to most military interventions). Starting around 2015, the alt-right got a big influx of activists from the so-called manosphere, an antifeminist online subculture that promoted intense misogyny and developed coordinated online harassment as a powerful tool for attacking women and their allies. Most alt-rightists embrace some form of white nationalism, involving calls to replace all or part of the United States with a white ethno-state. Some of these activists identify with the tradition of National Socialism while others do not. Kuhn: What does your new book Insurgent Supremacists add to Arier, Patriarchen, Übermenschen? Lyons: Insurgent Supremacists updates Arier, Patriarchen, Übermenschen’s analysis by three years and combines it with a lot of other material, such as a chapter on the origins and development of the alt-right. There are chapters on several themes that cut across different sections of the far right, such as gender politics and anti-imperialism. Insurgent Supremacists also explores the complex interactions between the far right and certain other forces, including federal security services such as the FBI, as well as Donald Trump’s presidential campaign and administration. Lastly, there are discussions of fascism both as a theoretical category and as a term of political debate that has often been misused against authoritarian conservatives or liberals, or against the existing U.S. government. Kuhn: For many years, you've been involved in the blog Three Way Fight. Can you tell us more about the three ways fighting here? Lyons: Three Way Fight argues that revolutionary leftists face two major poles of opposition: (1) the existing socio-economic order that centers on global capitalism and related systems of oppression, and (2) fascist and other far right forces that grow out of the existing system but also clash with it in real ways. We need to combat both, but they require different strategic responses. Far rightists aren’t simply tools of the ruling class, but rather form an autonomous political force that wants to secede from or overthrow liberal-pluralist political systems such as the United States and replace them with a harsher and potentially more genocidal political and social order. At the same time, by presenting themselves as the only real opponents of established elites, far rightists exploit popular grievances and seek to rally mass support away from any liberatory anti-capitalist vision. 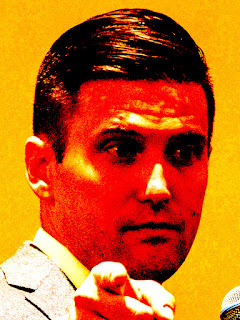 Photo credit: Photo of Richard B. Spencer in 2016 (cropped). By Vas Panagiotopoulos - 19 November 2016, CC BY 2.0, via Wikimedia Commons. Colors have been altered.